If you read our previous blog titled “How To Avoid The 4 Barriers to A Winning Call Center Quality Program And Start Getting Consistent Results”, you’ve discovered the fundamentals to getting quality results: Solid Data + Quality Analytics + Reviewing Trends + Action. While paying attention to those fundamentals will benefit your call center, it’s taking action — the RIGHT action — that can make or break your business. Therefore, in this blog, we will dive even deeper into this issue. 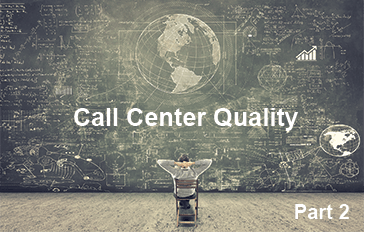 If your call center quality program lacks any one of these fundamentals, this blog post will help you to address those issues. The results: A better call center that delivers the sales, service and business-enhancing results you want. Many of the call centers we work with have ample data, analytics and trending “maps” to know where the problems lie. Many managers and executives know what issues they face. They just aren’t clear which decisions and actions to take to improve their call center. Below are 2 positive ways your call center supervisors, managers and agents can use the service improvement data that’s presented to them and take results-driven action. Results-Driven Action #1 – More Engagement. Better Engagement. Engagement is essential. Certainly your call center agents must know how to best engage the customer. But that can’t happen until there is better engagement everywhere else. Your supervisors and agents must spend more time engaging with the service improvement data. Knowing how to read this data gives everyone specifics around how to improve service quality. So, start there: Ensure supervisors and agents spend more time evaluating the analytics. Working with call centers for years across many industries, we have become experts at engagement. Now we have created an algorithm that seamlessly analyzes engagement at multiple levels of the quality management process. And yes, there is a direct correlation. Here’s an example of what can happen when you maximize engagement. One of our clients has multiple call centers. Therefore, we look at service quality achievement across all of their centers. Through analyzing data and trends, we identified two remarkably different groups. One group was performing at a very high level. The second group was performing at a much lower level. When we took a closer look, we noticed there was a large variant in engagement. This lack of engagement resulted in a service quality gap of just over 10% month after month. This was also reflected in their CSAT scores. We knew the problem was engagement. So we presented a clear plan to correct this problem. Suddenly, the entire call center team was paying attention. They were making the right decisions based on analysis presented to them. They were engaged! So, what results did this lower-performing group achieve? Even better, what type of results can you expect by increasing your engagement? Well, this group went from being the lowest performers to one of the highest performing groups in ALL of the call centers. It sounds amazing, but we see it all the time. Engagement is everything! Results-Driven Action #2 – Improve Consistency. While better engagement is paramount to a more effective call center, consistency is essential as well. Consistency in your philosophy. Consistency in your expectations. And consistency across all of your agents. If even a few customers notice this lack of consistency, you can bet it shows up beyond the call center. This inconsistency reveals itself in your level of service, in your sales, in your CSAT and in the success of your organization as a whole. Consistency is one critical KPI that you should regularly track and improve. Ignoring consistency over time can erode customer perception. For the longest time, we simply encouraged our clients to improve their consistency and engagement. We knew that if they took action, they could improve their organizations in many ways. Yet, still few took action. It wasn’t until we presented hard data, analytics and successful case studies — one after another — that they finally took action. Showing them the data made all the difference. Plus, making it available to the contact center manager as well as the company executives allowed them to see how the information was being utilized and the resulting positive impact on sales and service. If reading through this blog was like looking into a mirror for your call center, you now have direction to improve. First, start with your engagement. Engage your agents and your supervisors with your analytics. Then, better engage your clients and customers with every call. Next, focus on consistency. Any business can be champions for a few days. It takes consistency. Provide consistent feedback. Consistently communicate your expectations for your agents. And ensure each agent consistently engages with customers and clients. Following these proven directives will deliver better results from your call center quality management process. Before long, you’ll generate impressive results. Want even greater results? Connect with Sage Advantage to employ a seamless and professional call center quality program.